UFFE STEEN – Danish guitar-virtuoso and local hero, Uffe Steen, is slowly but surely making his presence felt around the scenes with his absolutely breathtaking chops and imaginative playing. Recently he also went viral (on TC Electronics FB site) with over 1,3 million views with his absolutely breathtaking chops and imaginative playing. His video works can be found on his you tube channel: https://www.youtube.com/stratosdane/ As a lefty, growing up with only a right hand guitar around, Steen wasted no time – he just flipped it and got busy playing upside down. By the time he learned that the strings were supposed to go the other way, he was already neck-deep in developing his own style. This pragmatic approach to the instrument might be part of what makes his playing so unique. Though he sees himself as a musician first, Steen has taught guitar at the Royal Academy since 1982, where he is also an associate professor. Steen’s playing never sounds rushed or difficult. His bends are wide and clear with an almost vocal-like phrasing a bit like the great Albert King. Even with those great masters in mind, Steen still doesn’t really sound like anybody else and no one else sounds quite like him – a hallmark of the truly great musicians. With a busy touring schedule, Steen’s approach to playing is that it has to be fun. That’s why he keeps challenging himself by learning new material and new ways to play. His tireless work ethic and will to explore different genres has meant that Steen has evaded the pitfalls of falling into habits and staying in the comfort zone. Since he started performing in 1966, he has fronted several jazz ensembles but also served as sideman extraordinaire, lending his skills to different artists in a wide range of genres from folk to jazz and blues. With four solo records under his belt and over 70 album appearances since he started recording in the early seventies, Steen is a veteran with a distinguished recording career. His last record, Twangs, from 2011 was an eclectic mix of jazz, country, americana and blues, showcasing his mastery of the guitar and deep knowledge of the genres. 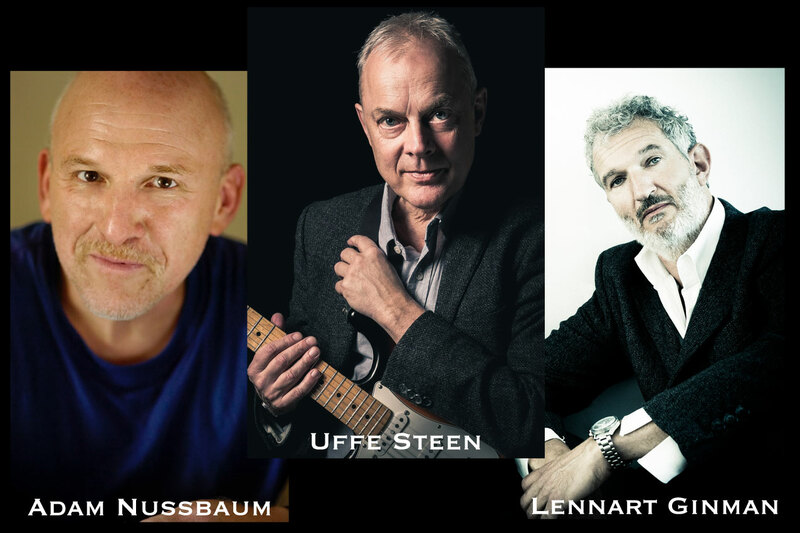 LENNART GINMAN – Lennart Ginman born 1960 is a Danish bass player, composer and producer. As one of Denmark’s most respected and accomplished bassists, Lennart Ginman has built an expansive body of work that encompasses a variety of significant projects, with many of the genre’s most inventive and influential musicians. Over the course of a performing and recording career that spans three decades, he’s earned a far-reaching reputation, for his instantly recognizable tone, and for the sensitivity, imagination and creative curiosity that have established him as an in-demand sideman and valued collaborator. Ginman is also a well-known producer and composer in the contemporary cutting edge music-field, working with some of the leading artists on the pop, rock and alternative hip hop scene. He has received successive prizes, Grammy’s etc. for his contemporary interpretation of modern songwriting, where he successfully manage to combine electronic and acoustic music into a dark, evocative, cinematic sound universe. Ginman’s upright bass work has been a longstanding fixture in the bands of leading jazz artists, and has graced live performances by a broad array of prestigious artists, including Lee Konitz, Kirk Lightsey, Johnny Griffin, Doug Raney, Chris Cheek, Harry ”Sweets” Edison, Scott Hamilton, Jim McNeely, Sigurdur Flosason, Horace Parlan and Kenny Werner. At present time Ginman can be heard on the Danish music scene with Palle Mikkelborg, Dicte, Cæcilie Norby, GinmanBlachmanDahl, Sinne Eeg, Ginman/Eivør and Tomas Franck Quartet. He’s also found time to make six albums with his own music and lyrics. His newest album ’The color of dark’ with Ginman/ Eivør was released on SONY MUSIC September 2014. “I’m hyper-aware of the balance between a studied approach to music and a more primal, instinctual understanding of the way music works,” Ginman states. “Having access to technique is useful in being able to communicate and express yourself musically. But music is about intuition and emotion. Compassion, strength, flexibility and stamina are all important qualities in playing improvised music, but the most important thing is the ability to listen.” “Even after all these years, playing music is still a learning experience for me,” Ginman concludes. ADAM NUSSBAUM – Adam Nussbaum is considered one of the finest drummers working today. He’s played with a virtual “Who’s Who” in the jazz world. Longtime associates have included: John Abercrombie, Michael & Randy Brecker, Eliane Elias, Gil Evans, Stan Getz, Vic Juris, James Moody, John Scofield, Joe Sample, Ohad Talmor, ‘Toots’ Thielemans, Kenny Wheeler & NHØP, as well as freelancing with prominent artists of every generation, being a major asset no matter where he appears. Nussbaum has joined forces with other musicians to form such groups as “BANN” w/Seamus Blake, Jay Anderson & Oz Noy, “We3” w/Dave Liebman & Steve Swallow, “The Impossible Gentlemen” w/Gwilym Simcock, Steve Rodby & Mike Walker, “The Nuttree Quartet” w/John Abercrombie, Jerry Bergonzi & Gary Versace and “The ZZ Quartet w/Ratko Zjaca, Simone Zanchini & Martin Gjakanovski. He’s been on hundreds of recordings, including the Grammy winning “Don’t Try This At Home” recorded with Michael Brecker. In addition, Nussbaum reaches out to the next generation. He is an in-demand educator doing Clinics and Master Classes, teaching at such institutions as Berklee, NYU, State University of New York, the New School, and at numerous Conservatories around the world. His abilities have brought opportunities for him to work with the finest makers of all things drum-related. Working with Sonor drums, he helped design a line in the “HiLite” series. In conjunction with Zildjian cymbals, Nussbaum helped developed the “Renaissance” & “Pre-Aged” K. Zildjian cymbals. He also co- produced with Hudson Music, “The Art of Playing Brushes.” He was born in New York City and grew up in Norwalk, Connecticut and started to play drums at age 12 after studying piano for five years; he also playing bass and saxophone as a teenager. He moved to New York City in 1975 to attend The Davis Center for Performing Arts at City College. He eventually settled on drums….